1) Fold a scarf, large napkin or Furoshiki cloth in half so that it form a triangle. Folding the top corner of the scarf's point down, tuck your bouquet of flowers in between the layers. 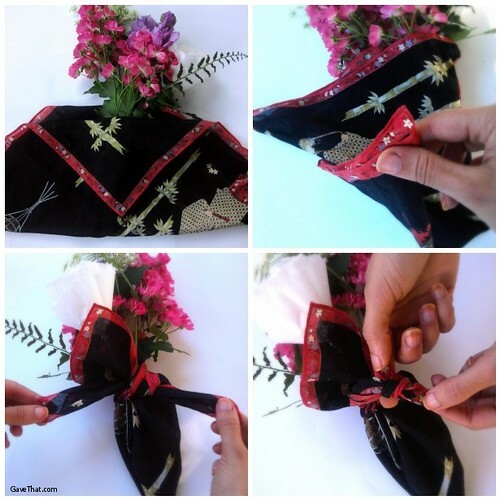 2) Taking the outer corners of the scarf cross them over one another to form a cone around the bouquet. Flip everything over. 3) Take the free "arms" of the scarf and tie a knot so that the bouquet of flowers is secure in it's little fabric cone holder. 4) Taking the what's left of the two pieces of scarf tie another knot close to their tips so you're left with a little loop in the back. If they won't be hung anyplace an alternative to the little loop is to bring the left over free pieces of the scarf back around to the front and tie a bow. My scarf used here is on the small side at 16 & 1/2 inches square. Using a larger scarf would allow for the loop to be much larger and the bouquet to hang lower down.